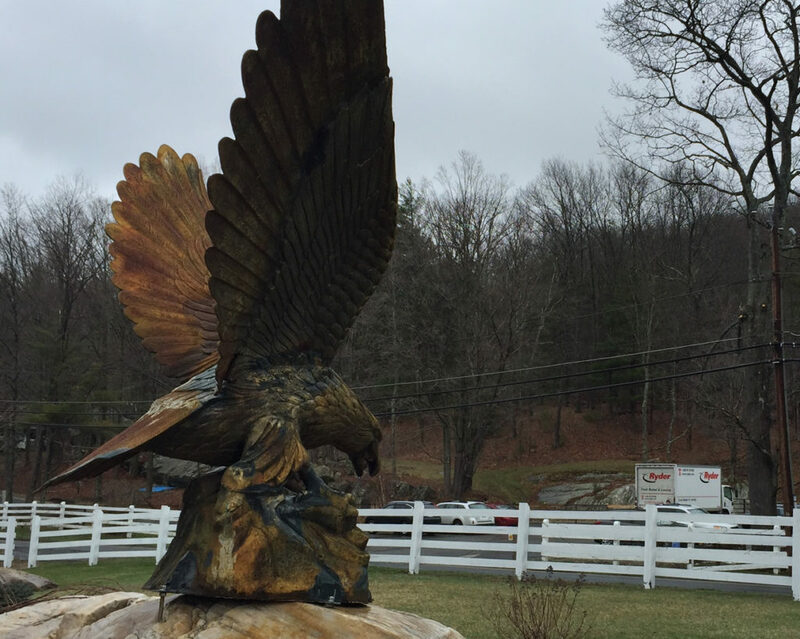 The Eagleton School's iconic eagle seems to be keeping a baleful eye on the Ryder moving truck parked outside the schools' classroom and office building. Great Barrington — After Eagleton School was told its licenses will be revoked over what the state said was a systemic culture of staff abuse of the school’s disabled male students and subsequent cover-ups of that abuse, the school was taken over by the state on March 24, and is now down to its last few students, who are being moved to new residential or other programs. The school’s 40 acres of land and buildings on Route 23 near the Monterey border are for sale. The state brought in John Foley of Center for School Crisis Intervention and Assessment, Inc. out of Holyoke to oversee the running of the school during what he says was a fast “emergency” transition over a period of two weeks, to both take care of its students, ages 9 to 22, and run the school until every child was out. Eagleton founder and director Bruce Bona, during a press conference at the onset of the school’s crisis. In an office that once belonged to Executive Director Bruce Bona, and was later occupied by the school’s lawyers, Foley told The Edge his role is strictly “rapid response to protect children,” and he would not comment when questioned about possible criminal charges being brought against more employees, Bona, or former Program Director James Yeaman. Calls to Bona’s Southfield home were not returned, nor were calls to school attorney Kathleen McCormick. After an investigation started by the Great Barrington Police Department prompted by a string of abuse complaints from the school for students with autism or developmental delays, the Berkshire County District Attorney’s office and State Police got involved and made five arrests; four for assault and battery of a disabled person, and one for tampering with evidence. The school has 24-hour video surveillance that police have accused employees of tampering with to delete evidence of certain incidents. The school’s licenses were pulled by the state’s Early Education Commission (EEC), which documented multiple incidents, among them students being struck while held in restraints. the Eagleton School on Route 23. “This is the first time I’ve closed a school,” he said, explaining that the situation was similar to what happened at the Peck School in Holyoke, where an investigation reported similar abuses of disabled students. Foley, a special education teacher, grew emotional as he described his role here, and at one moment paused to stop tears. “I take it personally when something like this happens to kids,” he said. In the next breath he said in 1975 he had worked as a psychology intern at the Belchertown State School for the Feeble Minded, a place that became a poster child for inhumane conditions in institutions. His work these last two weeks at Eagleton, he said, amounted to keeping the food truck coming, the buildings maintained, and the students cared for, all now with state money. He says he gets a lot of calls from creditors every day, and when asked if the school was in significant debt Foley refused to comment, adding that his role is strictly to protect and care for children. Foley confirmed the school property, owned by Eagleton School Inc. and Eagleton Properties, LLC is for sale, though a Multiple Listing Services (MLS) search did not turn up the property. All the school’s buildings and group homes combined on 40 acres are worth $4.6 million, according to town records, and throw off about $66,000 in annual property taxes. Another sticky spot is that Eagleton’s staff of 160 was given short notice, and he said his team is scrambling to deal with health insurance issues and to help with resumes. A representative from the state’s Health Connector program is at the school, he added. Laura Ferriter, an administrator with his organization who is also working in the office alongside him, said Eagleton falls into the exception to the U.S. Department of Labor’s WARN (Worker Adjustment and Retraining Notification Act) policy that 60 days notice is required for large layoffs. In this case, she said, the exception is due to “unforeseeable business circumstances” after its license was revoked. She said the Department of Unemployment Assistance (DUA) was immediately called and made aware of the situation. Article says: Laura Ferriter, an administrator with his organization who is also working in the office alongside him, said Eagleton falls into the exception to the U.S. Department of Labor’s WARN (Worker Adjustment and Retraining Notification Act) policy that 60 days notice is required for large layoffs. In this case, she said, the exception is due to “unforeseeable business circumstances” after its license was revoked. Guess what Laura? You don’t get to make this call. It will be made in a class action lawsuit, by a Federal judge. As I write this, class action lawfirms specializing in WARN violations are being contacted. Prior to today, the day of the shutdown, Eagleton employees received no formal written notice of their impending layoff. Yet, you were called in on March 24 to initate the shutdown – more than two weeks ago. And the EEC published its notice that Eagleton’s licenses would not be renewed on March 17 – more than 3 weeks ago. And the EEC published its sanctions order on February 17 – more than 7 weeks ago – indicating that Eagleton’s license would not be renewed if it did not comply with the sanctions. Unforseeable circumstances? Hardly! The class action attorneys will eat this up. Have fun with that. Since MA took receivership on March 24, and closure is today, it looks like this will be on MA. This is probably fitting, as ineptitude and possible corruption of MA state agencies charged with oversight of Eagleton were likely key contributing factors to this horrific situation. It is interesting to read the “after the fact” EEC reports, wherein it appears to me that EEC, DPPC, et al are trying to cover up their gross ineptitude and possible corruption .e.g. by claiming they weren’t notified in a timely fashion of instances of abuse. They may not have been notified by Eagleton officials in a timely fashion, but I don’t believe for a second they weren’t notified in a timely fashion by others. So tell me, what disciplinary actions have been taken by the responsible state agencies against their employees and how many employees have actually been fired for gross dereliction of their duties and/or corruption? Probably zero. But that’s the next part of this horrific story…the complete and total failure of the state agencies charged with the oversight of Eagleton. And what a story it will be. Stay tuned. Related to the above, I have no doubt that a slew of additional criminal charges are forthcoming against Eagleton leadership and select staff related to horrific instances of abuse and corruption. Were these delayed until the EEC closed the school, to provide cover for EEC, DPPC, etc., given the horrific nature of the events? Hmmm. I suspect so. And strongly. In my opinion, Eagleton isn’t the only party involved in covering things up…the state agencies are covering up their past sins here as well. Folks, if EEC, DPPC, et al aren’t held fully responsible and accountable here, it WILL happen again, somewhere else. Of that I am 100% certain. We owe it to the autistic kids who have suffered immeasurably here to be sure this can never happen again. See p. 11, first paragraph. Even with an exception, notice must be provided as soon as practicable, and employer must provide a statement of the reason for reducing the notification requirements and fulfill all other notice information requirements. NONE OF THIS WAS DONE = VIOLATION! So, even with the argument that an exception applies (which it does not in this case! ), there are still numerous WARN violations. Great Work Carla putting this all together. This has been Eagleton Admin’s M.O. the whole time. Act like they are in the clear and are doing everything possible to find out “What happened at my (BRUCE BONA) school? Playing dumb is so transparent. As if you didn’t know? hahahaha. If it were not so disgusting that these kids suffered so long, it would be a farce. And the creditors? How will he ever sell the property with all the liens that will be taken out on it? Kolburne hasn’t sold yet as far as I know and it’s been years. I know you’re passionate about what you believe to be true about “abuse” at Eagleton. I have been involved with Eagleton for 30 years. I can’t say for sure that abuse never happened, but ANY TIME it was suspected, the staff was terminated. These “kids” were never doe eyed little cuties, but big, strong and violent kids. I have been in physical altercations myself and I know, even with proper training, the instant you’re in a situation where another student is about to be smacked with a tire iron, your only choice is to dive in between the two students and take the hit in order to save the other student. You need to get in there and do the work yourself, before you judge. Students liked me, but that doesn’t mean I didn’t have to protect them by physically intervening sometimes. Times have sure changed, and there are a lot of super judgmental people who are very ignorant of the facts. I know that Bruce, and many of the staff worked tirelessly to make a better life for these kids. Most of the staff at Eagleton would protect, and did protect these kids with all they had. The picture painted here, (speaking of corruption) by DA Capeless (running for election and being financially sponsored by Hillcrest Educational Centers ) is so far from the truth it’s ridiculous. If every residential school was investigated like this (and having worked at 4, I know Eagleton was the only one to file 51As on a regular basis, while the others threw away incident reports and brushed things under the rug that may appear shady) heads would turn! I seriously doubt any of the incidents were ill intended, and I know the staff worked for low pay under harsh circumstances. (You’d never be able to handle it) The staff cared for, and even sometimes loved dearly, their students. This situation is an injustice to the staff at Eagleton, the students, the town of Great Barrington, and to Bruce Bona. You’re wrong about this on so many levels! Bev S, have you read the most recent EEC report detailing the atrocities at Eagleton, and the associated cover up? I have. You clearly haven’t. This is the EEC talking, not the DA talking. And it makes clear that your statement “any time (abuse) was suspected, the staff was terminated” is absolutely, categorically false. The only one ignorant of the facts here is you, apparently. Lastly you say “I seriously doubt any of the incidents were ill intended”. The EEC report absolutely contradicts this statement as well. Kids were pummeled for absolutely no reason. And remember Bev, all the deleted video files and emails have been recovered electronically. Sure hope you’re not the “star” in any of them. Hmmm, that would explain your unbridled defense of Eagleton, in the face of the scathing EEC report and EEC decision to close them down, wouldn’t it? So ….. how many jobs lost ? What will happen to the property ? Condo’s for the New Yorkers ? Maybe Hillcrest or another similar place will take over !? So many people that worked there lived in NY state. The kids are safe. That’s the point. Property needs to free of liens to be sold and Bona has been said to be in debt. That property is going to likely look like Kolburne. Been by there recently? Haunted house vibe. This is a sad thing to have happened to these children, and there is some beautiful property being put on the selling block. Wouldn’t it be wonderful if there was a way to turn this facility into a drug rehab center for those that cannot afford the higher priced ones? Let this somehow be removed from the present owner that should not profit from the crimes that were committed there. Let his punishment be monetary. Let us help the addicts that are trying to free themselves from their addiction and in turn they give back, a “pay it forward” kind of program. They start and do gardening, maintenance, or whatever skill they have to keep the program running. Donations, grants, silent partners or public if they wish. Let’s help save lives. We have the spaces Eagleton, kolbourne. Great idea, Casey! Thank you!